Home > Shop by Producer > Oliver Pluff & Co. The Tastes: English Wassail spice blends lend themselves perfectly to cider and wine. 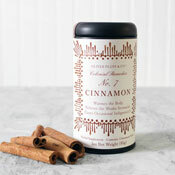 Wassail Kits for Cider come with 3 Muslin Spice Bags filled with cinnamon sticks, cut ginger, and ground nutmeg. Wassail Kits for Wine include 3 Muslin Spice Bags filled with orange peel, cinnamon sticks, cut ginger, allspice, and cloves. 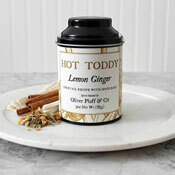 Orange Clove and Lemon Ginger Hot Toddy kits provide the ideal winter warmers. Hand-packed teas come direct from growers in India, China, and Sri Lanka as some of the freshest you'll ever taste. Luxurious papers wrap their packaging, which feels like an invitation to a very special experience. The Story: Charleston, South Carolina-based Oliver Pluff & Company's mission is to connect customers to American heritage through historic beverages. A self-proclaimed history nerd, founder Kyle Brown became intrigued by tea while living abroad in Africa and Istanbul. Enjoying the flavors and ritual, he launched the company with a focus on bringing specialty iced tea to American markets. A curiosity about the origins and history of beverages has broadened the line, which grew quickly after an order from Colonial Williamsburg and now sells to more than 300 historic sites nationwide.